I need much assurance and confidence when baking a chiffon or a sponge cake. My success rate for such is generally quite low. Thus though I love chiffon cakes, you can hardly see me baking it. But I told myself that this year I need to work on it and hopefully made some improvement. The year is coming nearly to an end but yet I didn't practice as much as I should have. With a lovely gift from 最爱的。。。, I found no more excuses for my lack of discipline. Next year, I promise that you see more chiffon cakes coming out of this kitchen. I don't know why the exterior is a little damp feel but luckily the texture is good. As I didn't want to damage the outlook of the cake, I was worried that 6 eggs batter couldn't fit into this and create 5 cupcakes out of it. Will check with IY for the next attempt. Thanks IY for your thoughtfulness. Note: Sorry won't be able to share this as the recipe is still being taught. Edith, my success rate of baking chiffon is low too leh, thats why even how I love chiffon cake, I hardly bake it, do not like the disappointing feeling lol. Your chiffon looks nice and fluffy, successful liao :). Jess, I think our failure is due to under baking. Try again. I am going to practise until I close my eyes also can do it. LOLz. Edith, it's not difficult to bake chiffon cake, it's much easier than cheesecake based on my view. I managed to get it right on the first time. I don't like to set the temperature too high, nowadays, I tried to set at 165-170*C (max 175*C) as I think it's easier to control the bake and get it right. The mixing with the egg white is very important, tried not to beat till stiff (soft peak will do) as it's very hard to mix. Try to use a larger mixing bowl and bigger whisk as I find it really helps. Cheer! Thanks Cynthia, noted on the baking temp. BTW, your blog is no longer open for comment? I love chiffon! Yours look perfect. Where did you get the heart shape tin? So lovely! Thanks. It was a gift. Edith, love the heart shaped chiffon! It turned out well. I have never done a chiffon successfully before so you are still many notches more skillful. I love the clean edges - lovely! Lovely chiffon cake, looks soft and spongy! I love eating chiffon cake, and what a co-in, I've just posted one too! Have a great week, Edith! Your chiffon is lovely. Your unmoulding is so clean and neat. 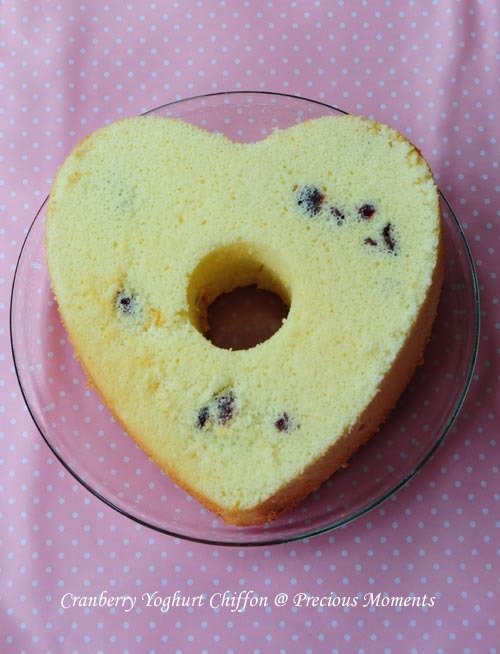 How big is your heart shape chiffon mould? Mine is 6" i bake with 2-3 eggs. Depend on the size of the egg. Thanks Mui Mui. Mmmm... I don't know how big, I need to measure but how to measure it with dimension like this?